The chairman of the House Intelligence Committee is facing calls to resign, but he says he's not going anywhere. House Minority Leader Kevin McCarthy, Trump adviser Kellyanne Conway and numerous GOP lawmakers are calling on Schiff, a California Democrat, to resign as chairman of the House Intelligence Committee for having claimed there was "more than circumstantial" evidence that Donald Trump's presidential campaign conspired with the Kremlin in an effort to win the 2016 presidential election. "You cannot have a chair of a committee that misled the American public, misled their conference, in a moment that we now have an answer," McCarthy said. "It is a time to turn the page and let America trust the committee again." "He's been dishonest with the American public on what was happening, blaming the Republicans" for stifling the congressional probe into Russia's election meddling, Turner said Tuesday on CNN. Rep. John Ratcliff, R-Texas, a member of the intelligence committee, criticized Schiff and others who have claimed to seeing collusion. "The special counsel said there is no evidence of a Trump-Russia collusion conspiracy, which is a clear indictment of those who say they have such evidence of collusion or conspiracy," Ratcliff said. "They helped Putin consume the public discourse for two years about a false story they claimed was true and, in so doing, gave Vladimir Putin a kind of success he could not have possibly imagined." Conway said earlier this week that Schiff should resign from Congress altogether, a call she doubled down on Tuesday. Schiff has long been one of the loudest Democratic voices on the issue of Russian interference, repeatedly suggesting more incriminating information would emerge from the investigations into the Trump campaign. "I can tell you that the case is more than that and I can't go into the particulars, but there is more than circumstantial evidence now," he told Chuck Todd on MSNBC's "Meet the Press Daily" in March of 2017. He's also said the Russia case is "a size and scope probably beyond Watergate." 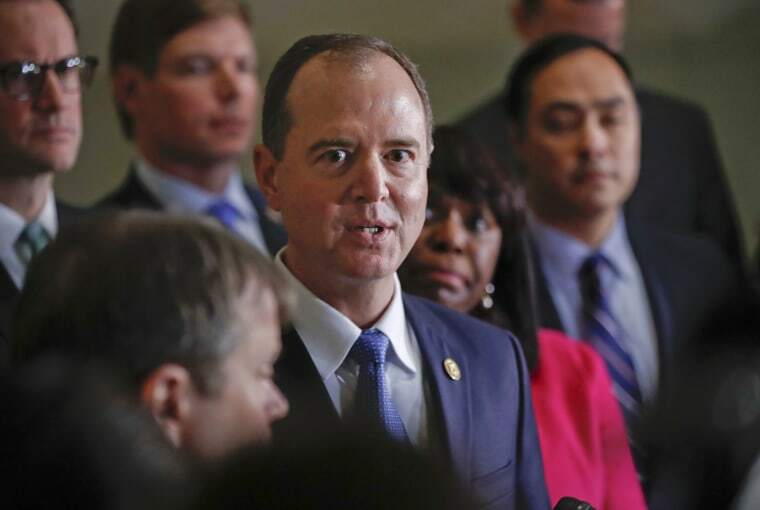 "The American people need to see the whole report, and we'll be discussing with leadership if necessary what steps are going to be required to make that happen," Schiff told NBC News. On Monday, he told the Associated Press that while there was evidence of collusion in "plain sight," he accepted Mueller's conclusion that he could not prove a criminal conspiracy beyond a reasonable doubt. Of the GOP attacks — which included a call from the Trump campaign that he be kept off television — he said, "I take it as a sign of effectiveness that they feel the need to go after me." "I got along with Adam for a number of years, but in the last two years he has gone off the rails. If there's evidence that Adam has, he needs to come forward," King said, but "if Mueller couldn't find anything, I don't know where Adam Schiff is going to find it." Alex Moe and Marianna Sotomayor contributed.